It has been said that there are two kinds of people in the world, those who divide the world into two kinds of people and those who don't. It's not accurate. 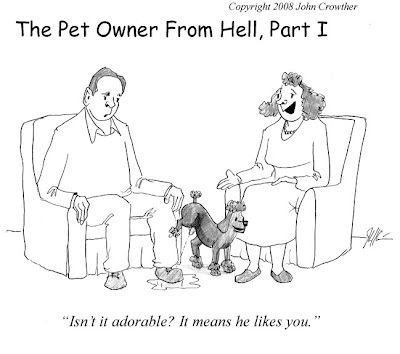 Actually the world consists of pet lovers and non-pet lovers, and between the two there's an abyss. Notice I didn't say pet owners. There's a difference between simply owning a pet and believing one's beloved animal possesses remarkable intelligence, deep sensivity, a range of emotion, and unerring instincts. I admit I'm one of the latter. My dogs even occasionally provide me with cartoon ideas. Completely off the subject and off-the-wall: on this day in 1630 popcorn was introduced to the Pilgrims by the American indians. This is not the start of a riff on huge buckets of the stuff soaked with imitation butter at the local multiplex. I only mention it because I'm wondering who the heck it was that was so enamored of the gustatorial sensation that he marked the date in his diary. I believe the indians accidentally discovered it during their early experiments trying to develop a gunpowder substitute. In his classic study “In One Head and Out the Other” the great anthropologist, Roger Price, proved that the original wheel invented by primitive man was square. As this wheel was used it constantly wore itself down into a round shape, much to the annoyance of its users. It was only after many eons of replacing the old worn wheels with new square ones that one of our ancestors gave up and started making them round. I am of the belief that popcorn, another of man’s greatest discoveries, also came about solely by accident. The Indians offered our Founding Fathers corn, but the clumsy Puritans kept dropping them into the fire causing the corn to explode and frightening away their indigenous neighbors. It was only after many decades that one such Puritan, cleaning up the mess, decided to taste one of the exploded kernels. He put some salt on it, opened a drive-in, and wrote the Declaration of Independence. Up to your usual standards of comments, il professore, now all I need to know is who invented the recliner to go with the popcorn and what was the date. I am one of those who carries a firm belief that my dog is perfect in every way. She has me well-trained; although I can often see by her expression that she is wondering if all her hard work is worth her time and effort. Speaking of animals who have us humans molded to their satisfaction, how is 'Cat with no name' il professore? Lee, I have done some research on the Recliner, and as I suspected its origin was again an accident. One afternoon in 1952 in a small town in Georgia an extremely overweight redneck was watching the game in his arm chair and had consumed so many six packs and eaten so many bags of Cheetos that his sudden increase of weight caused the back legs of the armchair to break behind him; the redneck was by then so drunk that he did not at first notice the damage; slowly he found his angle of vision improved: he could now watch the game over the mountain of his belly and rest the six pack on top of his navel. Thus another one of man’s great giant steps got stepped! Oh the wit on this blog is stiffling! lololol, love your explanation, il professore. I am certain that this is the true history of the recliner. Lee, felines --as we who know and love them--are extremely sensitive creatures, traumatized by abandonment. As I away from the hearth this summer trying to earn enough money to pay for all fifty flavors of Fancy Feast®, the Cat-with-No-Name sought affection and sustenance from another person. When I returned TCWNN snubbed me: she now no longer naps on my chest; indeed she no longer sleeps in my room at all. Nothing I can do, including rolling on the floor and pretending to be a ball of catnip, can win her back to me. Let this be a lesson to all of you who take their nameless pets for granted.